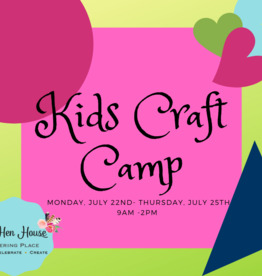 For the first time ever we are offering craft camp! This camp will offer fun filled days of creating crafts for incoming 3rd through 8th graders. Let's get our crafty on! Sign making- Hair Accessory & Jewelry Making- and so much more! Camp location: 11730 North Dale Mabry Avenue in The Main Street Plaza at The Hen House. Early Sign up before March 31st $225. Shannon is one of The 3 Hens, a local Carrollwood resident, and a crafty chick extraordinaire! One of her greatest passions is teaching others and sharing her knowledge. She creates many of the products at The Hen House and also teaches many of our classes as well. She loves working with kids and helping them find their own uniquely fantastic creative spark!